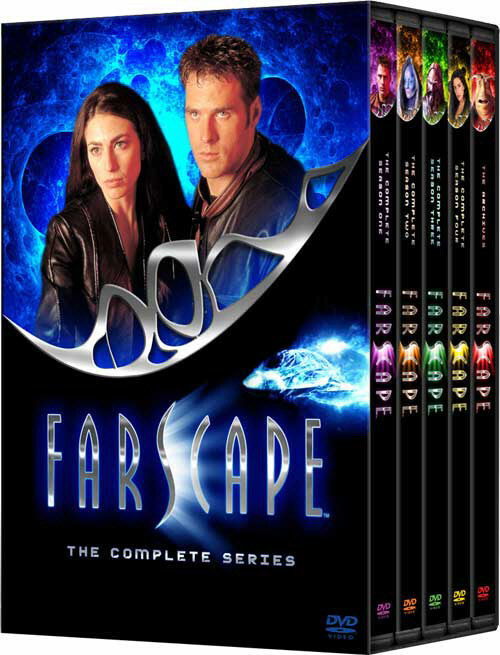 I recently re-watched the first season of a brilliant sci-fi program from down under, Farscape (1999-2003). The whole series came fairly cheap on DVD and I really feel like I got my money's worth. Created by Rockne S. O'Bannon (way cool name! 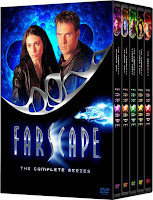 and he also wrote for seaQuest and Alien Nation), the series concerned the adventures of Earth astronaut John Crichton and a motley collection of escaped prisoners on the run from the corrupt Peacekeeper regime in distant outer space. Like Blake's 7 with a budget. And Muppets. I like all the characters, really. Butch ex-Peacekeeper gal Aeyrn, fierce warrior D'Argo, grasping deposed monarch Rygel, blue priestess/murderer Zahn, street punk Chiana, tortured lunatic Stark et al. They're all very enjoyable for a group of desperate, self-interested alien jerks. And it's impossible to hate John. He's the local boy! But there's a special place in my heart for the gentle giant most directly responsible for making sure they all stay alive arn after arn, cycle after cycle. His name and/or species is Pilot. Desperate to see the universe but with no space travel of their own, Pilots bond physically and mentally with living bio-mechanical spaceships called Leviathans. 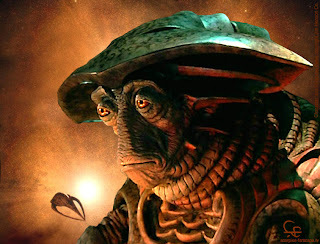 The Leviathan Moya is like a prison crossed with a flying whale and the primary setting of Farscape. Pilot's fusion with Moya was exceedingly painful and not completely at a time of his choosing. 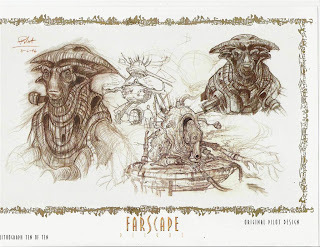 He was essentially enslaved and his lifespan was reduced by a third, but he regards the chance to travel in space as worth the sacrifices he's made. I admire his placid, patient demeanor, his competence under duress. Pilot is usually the voice of reason, the soul of restraint. He's like Wodehouse's Jeeves if Jeeves were a giant space octopus. Pilot is a large, multi-limbed animatronic monstrosity from Jim Henson's Creature Shop, operated by Sean Masterson, Tim Mieville, Matt McCoy, Mario Halouvas and Fiona Gentle. His calm, measured tones the performance of Lani Tupu, who impresses me every time I am reminded that Tupu also plays the mad despot Bialar Crace who spends the first season trying to recapture and execute our heroes. Frell me, that's a great show! Wildly imaginative, exciting, just plain fun. Plus I'm totally digging the ongoing comics Boom! Studios is putting out. Gotta see me some season two again!